Lover Man is an exciting live album recorded during the label Three Blind Mice's jazz festival called "Live in 5 Days in Jazz '75." 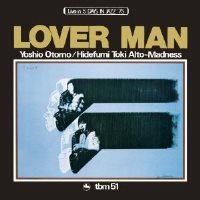 Two alto saxophonists Yoshio Otomo and Hidefumi Toki led a group called Alto Madness and performed a program in tribute to the alto great Charlie Parker. The program is only three tunes, but each lasts for ten minutes or longer. Fitting as a tribute to Parker, it opens with his bebop classic "Scrapple From The Apple" and followed by "Lover Man" Parker's recording of which is etched into jazz fans' memory. The program closes with a blowing-session blues. The two altoists are both very strong and have contrasting styles and sounds. Also noteworthy is the strong solos by guitarist Kazumi Watanabe who was only 22 years old at the time. Produced by Takeshi Fujii. Recorded live at Nihon Toshi Center Hall, Tokyo on May 26, 1975. Blu-spec CD is compatible with all regular CD players. Paper sleeve special limited edition.